Our best solution for the highest demands. 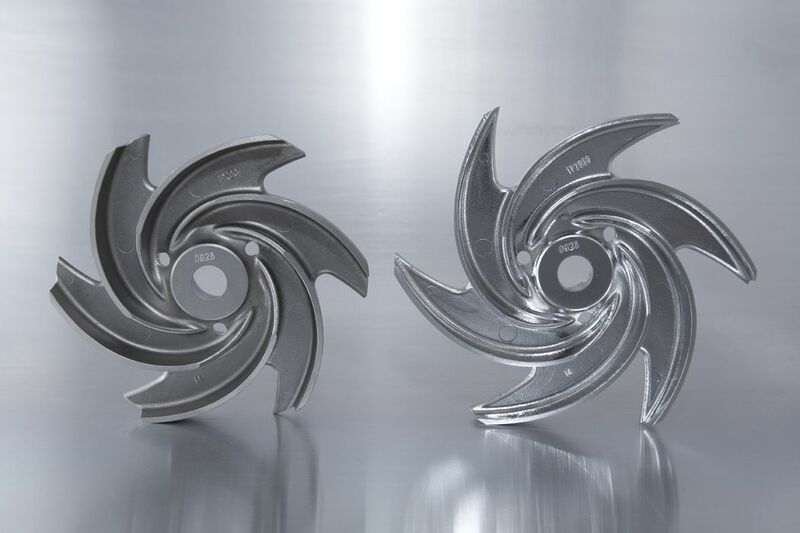 Electropolishing – how is it done? Electropolishing represents the reversal of the electrolytic process. 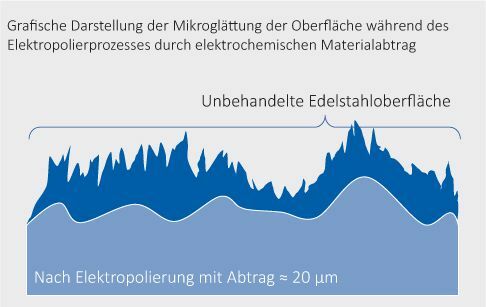 Under the action of direct current, metal is removed from the workpiece surface in an electrolyte (solution with high conductivity). The component to be electropolished forms the positive pole (anode) and the cathode the negative pole, which completes this electric cell. If the current flow is switched on, metal dissolves on the anode surface and dissolves within the electrolyte. The material removal can be specifically determined by the respective electrolyte, the current density and the polishing time. 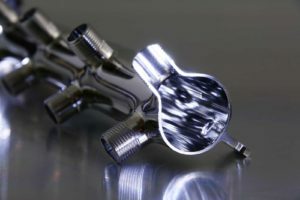 A feature of electropolishing is that the process is initiated only under the influence of current, so that the polishing can be carried out precisely according to the targets. In addition, the individual adaptation of the cathodes to the workpiece can also selectively remove material according to the customer’s requirements. A distinction of the surface specifications makes sense according to the application. Is it an optical or functional surface? Depending on the requirements, the luminance effect generated by electropolishing can already be sufficient. However, in industrial applications, target roughness values (e.g. average roughness Ra) are often defined which can be achieved by means of a concrete material removal. Typical removal values lie between 10 and 35 µm in the case of electropolishing. Depending on the starting material and pretreatment of the surface, however, these vary. Every material has particular characteristics. The composition of the metallic alloy has a considerable effect on the electropolishing.